Outrageous Tales From the Old Testament? 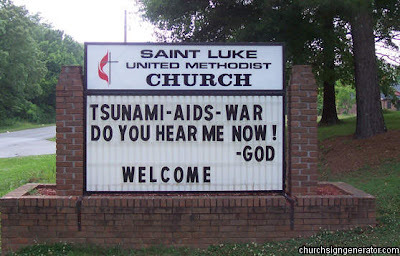 Some more genuine church signs from www.churchsigngenerator.com. I particularly like the last one. 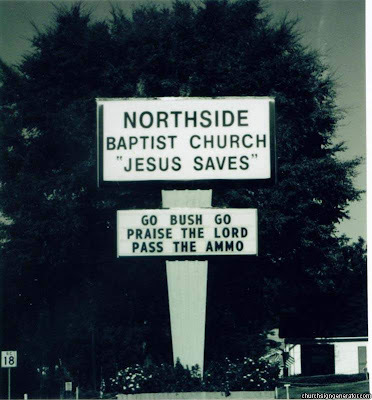 "A spirit filled church", is a nice touch. Very Old Testament. Their God is a smiting, fighting God urging his people to take up arms against his enemies. Does anyone have a favourite Old Testament tale involving God's gratuitous smiting, genocide, etc.? What's the most outrageous tale? Personally, I think Abraham and Isaac is hard to beat. As Alexander Waugh relates in his book God - The Biography. Talking of which, I have been trying for ages to get hold of a copy of Outrageous Tales from the Old Testament, now out of print it seems. If anyone has any idea how I can get a copy, do let me know. Neither the NSS nor Forbidden Planet actually have it, despite what it says on their websites. As a big fan of Neil Gaimen I'm going to have to order that!! Ah - great. Just ordered it. Thanks Mike. I don't get the logic (because it doesn't work): We make the world a worse place by doing things bad according to the Bible, so God makes the world worse in retaliation! "Outrageous Tales From the Old Testament" looks great. I just ordered myself a copy from Amazon. I found the ISBN number (0861660544) from Google and then it was quite easy to find copies. I think He's trying to make the point that, being omnipotent, He's not going to be outdone by a bunch of upstart mortals. Any 'evil' we can do He can do better! Does this also solve the problem of evil? Can I recommend Jay Pinkerton's Back of the Bible? It's quite a ride. I can do no better than to recommend the Skeptic's Annotated Bible (www.skepticsannotatedbible.com). It has a page-by-page humorous annotation of the King James version of the bible, or you can simply search by category: absurdity, intolerance, cruelty and violence, contradictions, etc., etc. It really is loads of fun! Enjoy! 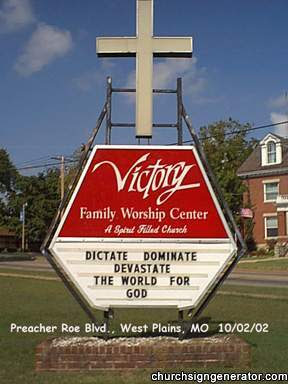 Customize your own custom church sign messages @ www.SignGenerator.org. btw don't make the mistake of thinking these aren't genuine signs. They do come from churchsigngenerator.ocm, but from their library og genuine signs.